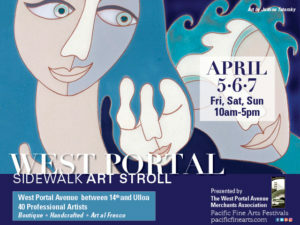 West Portal Sidewalk Art Stroll April 5,6,7 - Welcome to West Portal! Avenue between 14th and Ulloa. Local residents and tourists alike admire the works of more than 40 artists displaying everything from photography, paintings, ceramics, jewelry and much more. The show is free to the public and is presented by the West Portal Avenue Merchants.